The Masonic life of Robert Burns began on July 4, 1781 when he received the first Masonic degree. He received the next two degrees in October 1781, thus becoming a full member of the Fraternal order through St. David's Lodge in Tarbolton. With few exceptions, almost all of his close male friends were to be members of the Craft. He was elected Deputy Master on July 27, 1784. This is a very short time for anyone to advance in a Masonic lodge. That could happen only to a very active member that was well liked. Burns wrote The Farewell when he thought he was leaving the Lodge to emigrate to Jamaica. However, when his path led to Edinburgh instead, he became an honorary member of St. John Lodge #22; this lodge was the first to admit an honorary member. On February 1, 1787, he became a member of Canongate Kilwinning #2, that met in the oldest Masonic lodge room in the world. On March 1, 1787, he was made Poet Laureate of this lodge2. On May 19, 1787, he became a member of the Consistory or a 32nd Degree Mason. On December 27, 1788, he moved his membership to the St. Andrew Lodge #179 in Dumfries. Burns' membership in Masonic lodges and his devotion to Masonry enabled him to meet people normally out of reach to a poor Scottish farmer in the eighteenth century. Friends he made as a result of his Masonic activities were a great influence on him. Two of these men were: Dr. John MacKenzie, who wrote Origin of Morals and Common Sense, and Sir James Hunter Blair, grand master of Scotland, after whom Hunter Street and Blair Street are named. Another of Burns' Masonic friends was the Rev. Dr. Mathew Stewart, a noted geometrician and Professor of Mathematics at the University of Edinburgh; in 1785, he became a Professor of Moral Philosophy at that same institution. Gavin Turnbull, another Masonic Friend, wrote a poem to Burns, To Mr. R. B. When Burns became friends with the Masons of his time, he found himself in a rare company of men. Major William Parker was a banker and the Master of Kilmarnock Kilwinning Lodge. He knew Sir John Whiteford, Master of Lodge St. James, who in 1766 became Senior Grand Warden of Scotland. He was friends with John, Duke of Atholl, 32nd Grand Master of Scotland and Sir William Forbes, Grand Master of Scotland from 1776 to 1778. The 34th Grand Master of Scotland, the Earl of Buchan, was another friend. It is impossible to assume that these men had no influence on Robert Burns, who found the most educated men in Scotland associating with him at meetings and social events. It was a challenging and vibrant society. It is also interesting to see how the men he met in the lodge changed the course of his life and brought his work to the notice of the world. Henry MacKenzie, author of Man of Feeling, was a member of Canongate Kilwinning Lodge and one of the first to extend to Burns kindness on his arrival in Edinburgh. Later, Burns was to say that, after the Bible, MacKenzie's book had the most influence on him and that he wore out two copies carrying them in his pocket. Captain Francis Grose did a drawing of Burns' father's grave; in return, Burns wrote Tam O'Shanter for him. Gavin Hamilton, a Master of St James Lodge, suggested Burns collect and publish his poetry. James Earl of Glencairn introduced Burns to William Creech, who became his publisher. Later Burns said of James of Glencairn, He is a stronger proof of immortality of the soul than any philosophy ever produced. A mind like that can never die. Professor Dugald Stewart and Dr. George Lawrie introduced Rev. Thomas Blacklock to Burns' work. The Reverend gave Burns the money for paper to make the second edition of his poems. Even after Robert Burns' death, it was Masons who helped keep alive the memory of Burns' life and works. John Ballantine, Master of Ayr Kilwinning Lodge in 1801, instituted the Alloway Club to celebrate annually the anniversary of the poet's death. On the 25th of January, 1820, a monument was erected in Alloway to the honor and genius of Robert Burns. This effort was led by Alexander Boswell, son of Samuel Johnson's biographer. 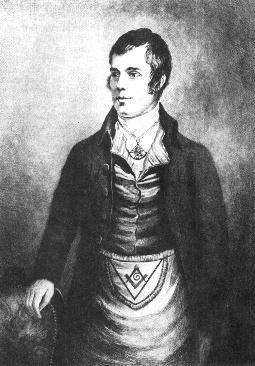 Not only was Robert Burns attracted by the Masonic works but his brother Gilbert also became a Mason on March 1, 1786, and in 1848 Burns' son, also named Robert Burns, became a member of Dumfries Kilwinning Lodge. In light of this information, it is not out of place to say that the Masonic Brotherhood had a strong lasting effect on Robert Burns. His membership in the Masons brought him in contact with people he would not otherwise have met, and the efforts of his fellow Masons hastened the acceptance and recognition that Robert Burns so well deserved. 1) Reprinted from Mither Wit and Native Fire, published by The Robert Burns Club of Milwaukee. Copyright (C) 1992, 1999 The Robert Burns Club of Milwaukee. All rights reserved.